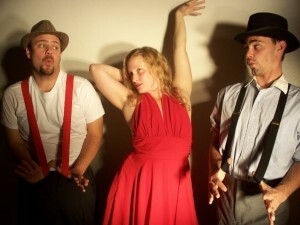 Burlesque and Vaudeville-style entertainment return to the historic Franklin Opera House as ARTFEST and Tabula Rasa present “A Good Ol’ Burlesque Show” on April 16 & 17 at 7:30 p.m. Tickets for this program of old-time comedy sketches, music and dance are available from The Middle at 603-934-1901 or at www.themiddlenh.org. 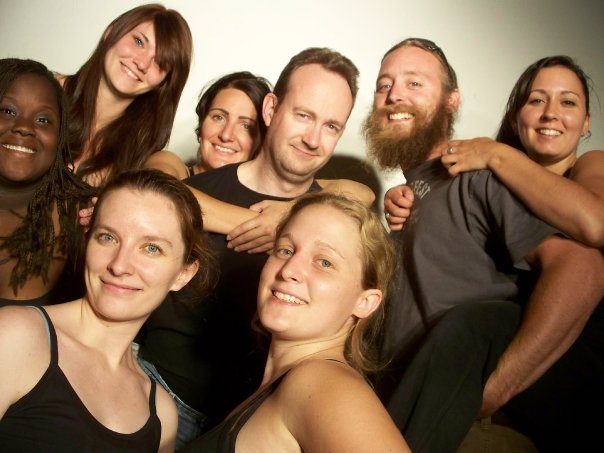 Shown here are (front) Erin Lovett Sherman and Rori Dawes, (back) Nicole Buttermore, Barry Livingstone, Kevin Borella, Nerrishia Bodwell and Mike Manning. 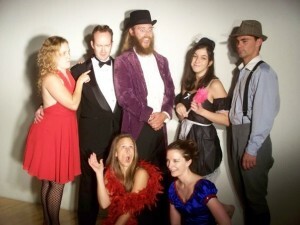 FRANKLIN NH- Burlesque is a humorous theatrical entertainment involving parody and sometimes grotesque exaggeration. In early 20th century America, the form became associated with a style known as Vaudeville, a particular genre of variety entertainment made up of a series of separate, unrelated acts grouped together on a common bill. By the late 19th century, most cities and large towns in America boasted a theatre or “opera house” featuring live entertainment, and the City of Franklin was no exception. From its opening in 1893 until the 1940s, the Franklin Opera House hosted thousands of burlesque and vaudeville shows, until the genres’ popularity declined with the increasing popularity of movies and later, television, resulting in the closing of the venue in the 1970s. The City Council and Franklin District Court used the opera house auditorium space for many years until, after a community fundraising drive and the renovation and restoration of the space, it was re-opened for entertainment. Now operated by the non-profit Middle New Hampshire Arts & Entertainment Center (“The Middle”), the historic Franklin Opera House will once again shake with laughter, as burlesque returns to its well trod stage for the first time in nearly fifty years. Two Laconia-based community performing arts groups, ARTSFEST Performing Arts Company and Tabula Rasa Theatre Company, have teamed up to present a vaudeville-style musical comedy revue, entitled “A Good Ol’ Burlesque Show,” to be presented two nights only, April 16 & 17 at 7:30 p.m. Directed by Rick Morten with choreography by Erin Lovett Sherman, lighting by Jordan Tankard and musical accompaniment by Phil Breton, the two-act show contains many classic routines made famous by such show-biz immortals as the Marx Brothers, Abbott & Costello, Gypsy Rose Lee, Milton Berle and Ann Corio (whose late-career show, “This Was Burlesque” played at the Lakes Region Playhouse in Gilford in the 1960s and -70s). Burlesque and Vaudeville-style entertainment return to the historic Franklin Opera House as ARTFEST and Tabula Rasa present “A Good Ol’ Burlesque Show” on April 16 & 17 at 7:30 p.m. Tickets for this program of old-time comedy sketches, music and dance are available from The Middle at 603-934-1901 or at www.themiddlenh.org. Shown here (L to R) are Rick Morten, Nicole Buttermore and Mike Manning. (“A Good Ol’ Burlesque Show” also includes excerpts from the 1979 burlesque-revival broadway show, “Sugar Babies,” starring Mickey Rooney. With a cast of well-known area actors and dancers, including Melissa Bigler, Nerrishia Bodwell, Kevin Borella, David Bownes, Peter Brunette, Nicole Buttermore, Rori Dawes, Ray Feola, Amey Garnett, Alison Henchey, Simone Henderson, Barry Livingstone, Erin Lovett Sherman, Mike Manning, Elis Marcoux, Rick Morten, and Kris Snow, and featuring several lavish production numbers by the ARTSFEST Dance Company, “A Good Ol’ Burlesque Show” promises to shake the historic Franklin Opera House to its foundations. Those interested in further information or purchasing tickets may call The Middle Box Office at 603-934-1901 or online at www.themiddlenh.org.